BloodNet 5 is on the way! BloodNet is being upgraded to improve the useability and functionality of the system. The main benefits of this upgrade include streamlined functions and an enhanced user interface. We are excited to announce that BloodNet 5 is targeted to ‘go live’ on Sunday 1 July 2018. Prior to the roll out of BloodNet 5, the NBA will conduct training sessions in May and June to give users the opportunity to familiarise themselves with the new system. Face to face training will be provided at nominated locations in every State and Territory and WebEx (web conference) training sessions will also be available to all users across the country. All training sessions will be widely advertised, including on the NBA website and on BloodNet. More information will be provided as soon as this is available. The redevelopment of BloodNet 5 is continuing with modules for Ordering, Receipting, Stock Movement, and Authorisation all close to completion. simplifying BloodSTAR messages to ensure up to date information is displayed. The BloodNet homepage has had a significant overhaul to provide users with quick links and actions from the moment you log on, as shown in the screenshot below. ​BloodPortal is the NBA’s single sign on solution allowing users of our blood sector systems access to applications including BloodNet, BloodSTAR, ABDR, Jurisdictional reports and respective training environments. the requirement for users to update their password every 90 days. The targeted release date for the new BloodPortal is Sunday 1 July 2018. More information will be provided closer to the time. The NBA is continuing to work with new and emerging LIS providers to progress BloodNet LIS interfacing. The Pathology North (NSW) eBlood system was the first certified BloodNet LIS in 2017, accounting for 8% of total national orders. Citadel Health (AUSLAB) achieved BloodNet LIS Vendor Certification that enabled Queensland Health to achieve BloodNet LIS Facility Certification, and this implementation went live on 7 June 2017, accounting for an additional 11% of national orders. Haemonetics achieved BloodNet LIS Vendor Certification in June 2017 for its BloodTrack system. Cirdan (Ultra) also recently achieved Vendor Certification on 22 December 2017, enabling Ultra BloodNet LIS interface implementations nation-wide to be progressed. Intersystems (TrakCare) has commenced Vendor Certification testing of its LIS interface. Current LIS interfaces into BloodNet are responsible for processing 35% of total national issues of fresh blood products. Development projects currently in train will increase coverage to 76% of total national issues when fully implemented . The NBA is actively engaging with all suppliers and Laboratory Information System (LIS) vendors to discuss plans and timelines for implementing transition labels. Samples of barcodes created by suppliers and provided to the NBA are available on the NBA website here. The requirement for all suppliers to have their transition labels on by January 2016 has largely been met, with some extensions granted to specific suppliers on request. The full transition to the new GS1 barcodes began on 1 January 2018 and the NBA is continuing to consult with all stakeholders to complete this piece of work. 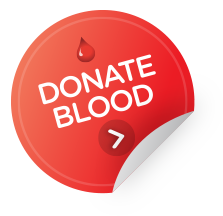 The Australian Red Cross Blood Service (Blood Service) will be implementing the Information Standard for Blood and Transplant (ISBT 128) for all fresh blood products and the release date is targeted for 29 July 2018.
component codes will change, increasing from five digits to an eight digit character code. An ISBT 128 Information Pack explaining the changes and sample labels for testing systems can be requested from Blood Service at ISBT128enquiries@redcrossblood.org.au. The NBA is working to ensure that there is minimal disruption to BloodNet as a result of ISBT 128 implementation. BloodNet will display the information as per the issue note generated from the Blood Service. BloodNet will be configured to read both the ISBT 128 and Codabar barcodes when they are scanned. Whether or not your facility is adopting ISBT 128 immediately, the LIS will need to be updated to be able to capture the 14 alphanumeric DIN. ISBT 128 uses a different barcode symbology from Codabar barcodes. Your system will need to be configured to be able to read ISBT 128. Scanners will also need to be configured to read the new barcodes. The interface between BloodNet and LIS will be able to handle both the current Codabar and ISBT 128 information. This means that the interaction between BloodNet and LIS will be compatible during the transition period. 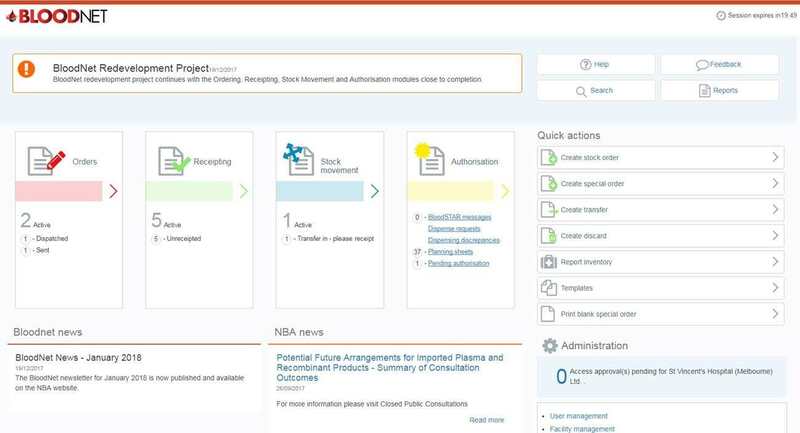 The NBA recommends the interface be tested and verified in the NBA User Acceptance Testing (UAT) environment. The NBA will notify interfaced LIS vendors when the UAT environment is available. Further information is available from the NBA and Blood Service websites. If a vial of Ig is broken, damaged or something goes wrong while infusing a patient and the dose is partially infused, the medical staff caring for the patient are not required to request authorisation for an additional dose within BloodSTAR. Log into BloodNet and navigate to the patients ‘View Authorisation’ page. On the patients treatment plan against the relevant line click ‘Return to Stock’ and fill in all relevant data. Once the return to stock is completed you can then dispense product against that same treatment line by clicking on ‘Dispense’. Please ensure that a discard episode is then created for the broken vial that you have returned to stock. If the dose was partially infused and the vial(s) cannot be returned to stock, you can issue the replacement dose on the same treatment line as the original dispense in BloodNet. The system will trigger a dispense discrepancy and ask you to provide a reason for the additional dispense. Enter in the reason for the dispense discrepancy and it will be resolved immediately. This will open up the ‘User Access Request’ page showing your personal details and an ‘Add role’ button. Click on ‘Add Role’ and select the relevant required role, state/territory and facility and then click ‘save’. Facility User: General users of BloodNet to order, receive and fate blood and blood products. Facility Administrator: Users of BloodNet with administrator rights which gives the ability to approve users, change templates and add news items. Once approved facility administrators will also be granted facility user access to the facility indicated. LIS Administrator: Responsible for monitoring and configuring anything required for LIS interfacing with BloodNet. You should only select this option if you are involved in implementing a BloodNet-LIS interface at your facility. Please note: You can add as many roles as required. Once you have added all the roles that apply to your positions to all the facilities that you require access to, click on the BloodNet User Terms and Conditions, read through and click the ‘Accept’ button to proceed with your request. 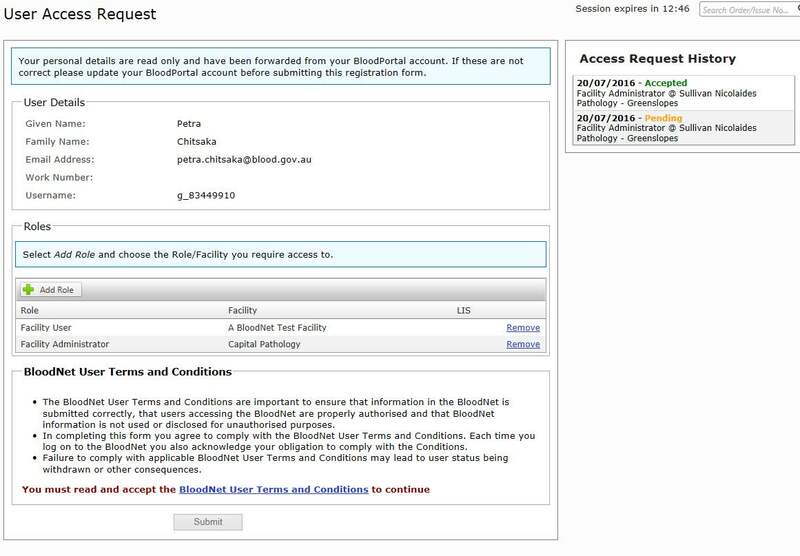 If you do not agree to the terms and conditions you cannot gain access to the required BloodNet facilities. Finally, click the ‘Submit’ button. This will forward your access request to your facility administrator for approval. Once your access request has been actioned you will receive an email to inform you of the outcome. Anytime you are logged in, you can determine the status of your application by checking your ‘Access Request History’ on the right side of ‘User Access Request’ screen as shown on the image above. Further information on BloodNet is available online here or by contacting the NBA on 13 000 BLOOD (13 000 25663) or support@blood.gov.au.